how to spatchcock a turkey & roast a turkey this thanksgiving! a miracle method for roasting your thanksgiving, friendsgiving, or holiday dinner turkey. 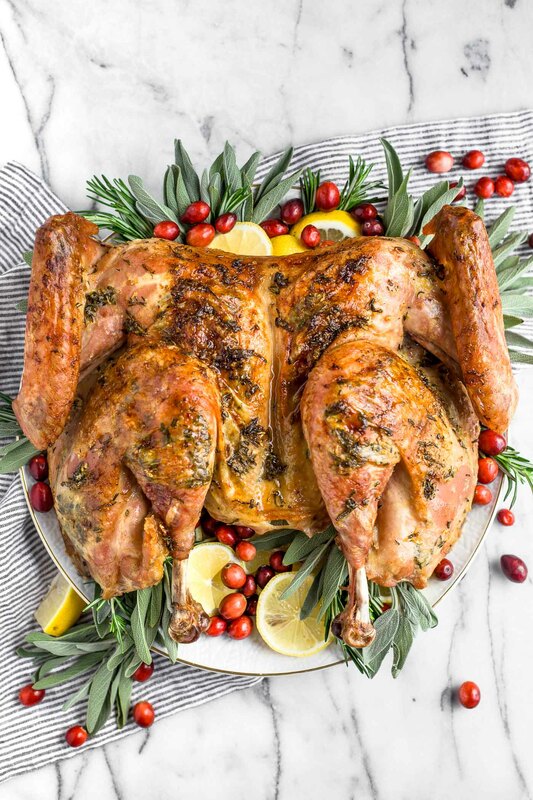 by spatchcocking your turkey, you can roast the perfectly juicy, evenly cooked, & flavorful turkey in less than 2 hours total & free up your oven for delicious pies & sides. spatchcocking will make your thanksgiving this year a total breeze! let’s make this year the year that you break up with your turkey roasting fear. you know…the little voice in the back of your head that tells you that roasting a whole turkey is so intimidating that you should avoid hosting your family’s thanksgiving dinner or your inner circle’s friendsgiving celebrations at all costs?! the voice that tells you that no matter how hard you try, your turkey is going to be overcooked & dreadfully dried out? the voice that starts to quiver when you think about how the heck you’re going to coordinate your oven’s holiday dinner line-up? um, yes?! we’ve all been there, trust me. today is your day. 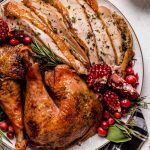 i’m cluing you in on my secret to prepping & perfectly roasting a whole, 14-pound turkey (like a boss!) in 90 minutes. pin how to spatchcock your thanksgiving turkey for later!!! you HAVE to spatchcock your turkey. but don’t worry. this isn’t a dirty trick. i promise. 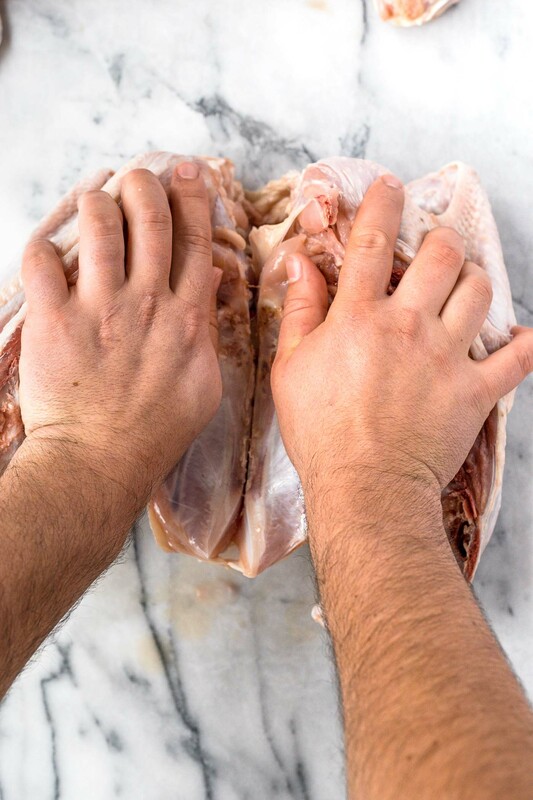 spatchcocking is a super simple & super effective technique of breaking down your your turkey that speeds up the cooking process (like, a ton) & results in a more evenly cooked bird every darn time. i swear to you that it will change your turkey game for good. i know you’re still skeptical. 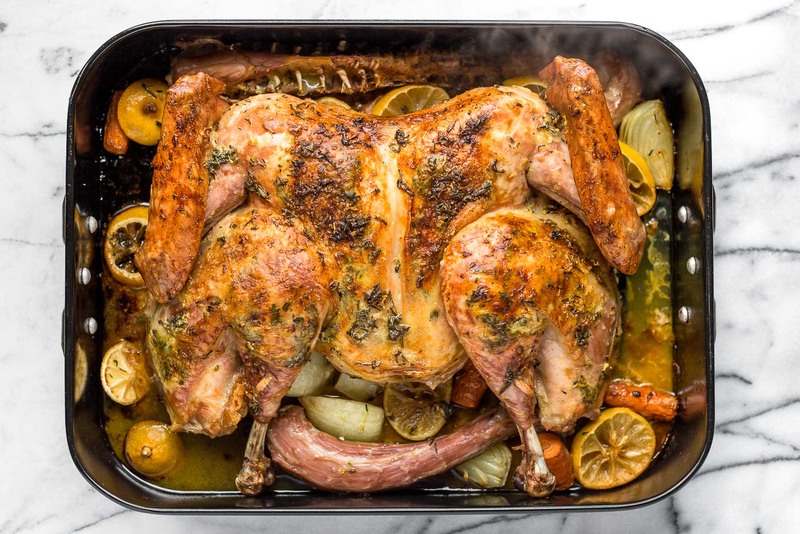 after all, just how daunting it is to perfectly roast a finicky turkey is the topic of pretty much every magazine article & cooking show out there this time of year. & i completely understand the skepticism. i’ve been there too. but then i lived through the miracle of the spatchcock. the first time i ever even thought about attempting to roast a whole turkey was a few years back. chris & i volunteered to host friendsgiving at our place for the first time ever. & as the hosts of the dinner, per our friendsgiving tradition, chris & i were responsible for providing the turkey. that particular friendsgiving day, i will totally admit, was not one of my shining moments as a then-girlfriend-slash-roommate. 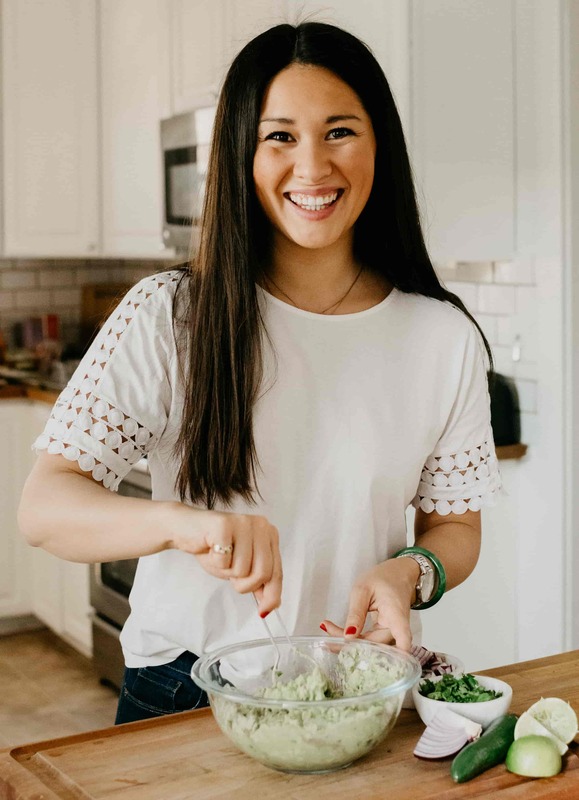 i got up early to begin prepping for our dinner, while chris slept in pretty late & watched a football game that went into the mid-afternoon hours…& i’m pretty sure you see where this is headed, but as our guests’ arrival time crept closer & closer i got completely overwhelmed. angry words were exchanged (#whoops 😬), tears of frustration were shed (#doublewhoops 😬), & there may or may not have been an incident involving a ton of peeled potato skins & our garbage disposal (ehrm, don’t ever try to put potato skins through your garbage disposal. just don’t. take my word for it.). the turkey was actually the only thing that saved our inaugural friendsgiving from being a complete disaster. that year, bon appetit called out spatchcocking as a miracle turkey roasting method, so chris & i planned to spatchcock our friendsgiving turkey all along. read on for step-by-step photos showing you exactly how to spatchcock thanksgiving turkey! 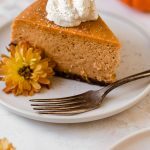 if you’re in the need for some help making your thanksgiving or friendsgiving as EASY as possible, check out my FREE 3-Hour Thanksgiving Guide! 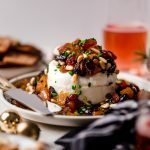 i created this guide based on constant feedback from my readers that the very thought of hosting thanksgiving or friendsgiving filled them with overhwelm. here’s the secret: it totally doesn’t need to! 3-Hour Thanksgiving is a complete guide for prepping, cooking & serving your thanksgiving dinner in 3 hours or less, including 5 amazing recipes, 3 bonus recipes, a full thanksgiving shopping list, & a step-by-step checklist to keep you right on track to serving at dinner time. grab your guide here (it’s FREE!)! to spatchcock a turkey simply means that you remove it’s back bone, which helps it to sit flatter as it roasts. it has a larger surface area, which reduces roasting time by over 100%. 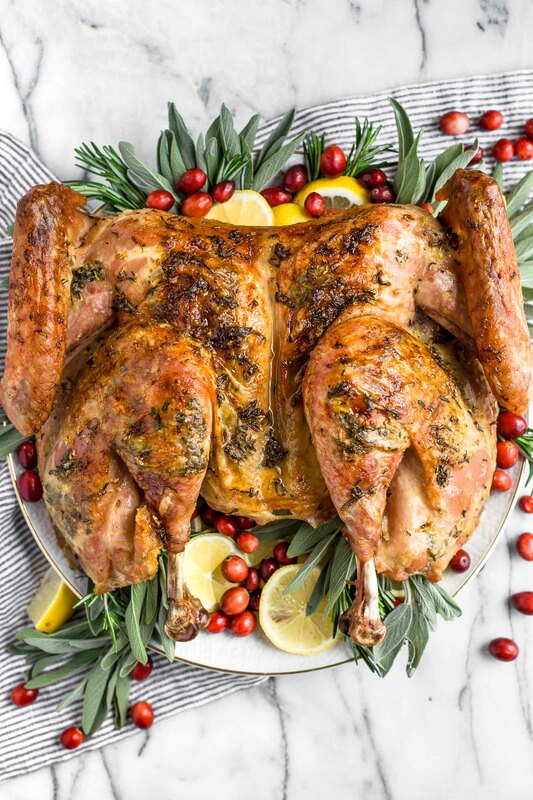 a 14-lb bird takes about 90 minutes to roast when it’s spatchcocked versus the traditional turkey roasting rule of thumb of about 13 minutes per pound (totaling to just over 3 hours!!). talk about saving some time & giving yourself the flexibility to use your oven for other treats & dishes! #1. the cast of characters for the spatchcock. 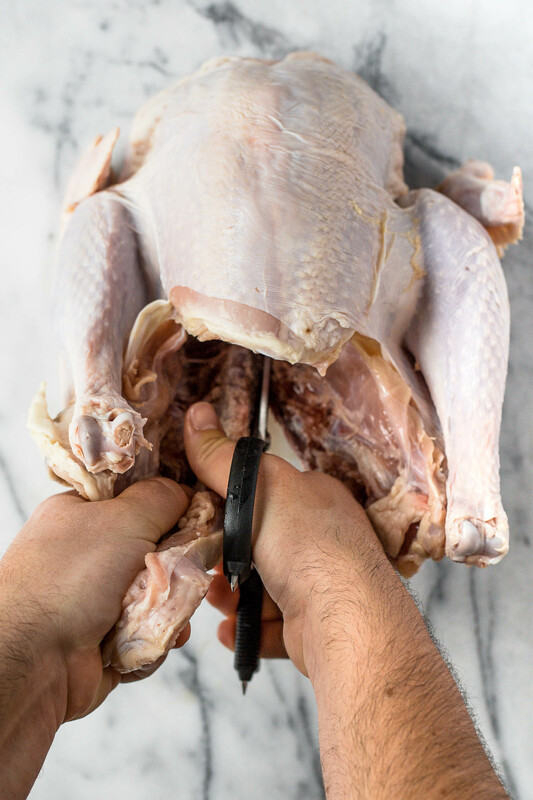 #2: start the spatchcock by snipping out that back bone! 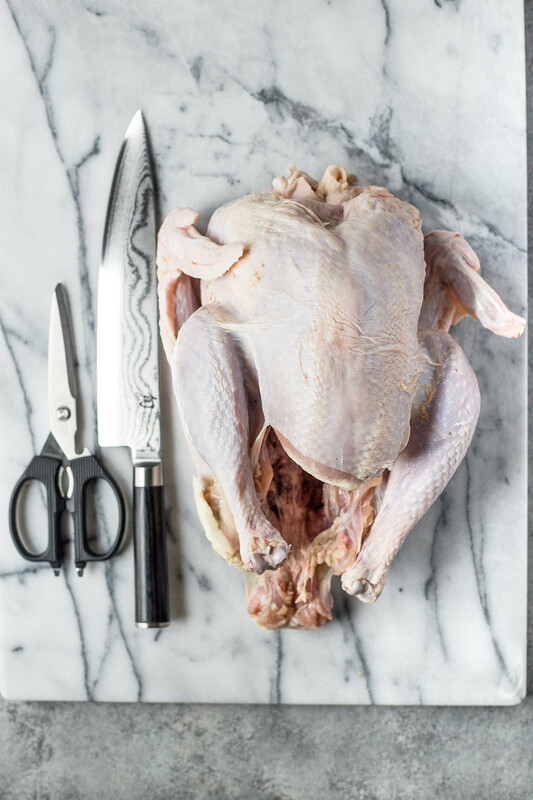 lay your turkey it breast side down on a plastic cutting board (or any sturdy & non-slip surface) & use your kitchen shears or knife to gently snip out its back bone. 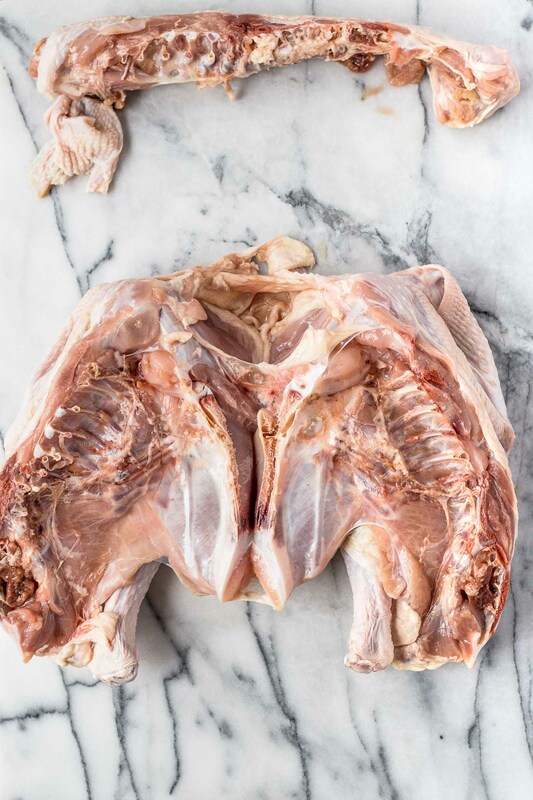 #3: score the turkey’s chest bone. 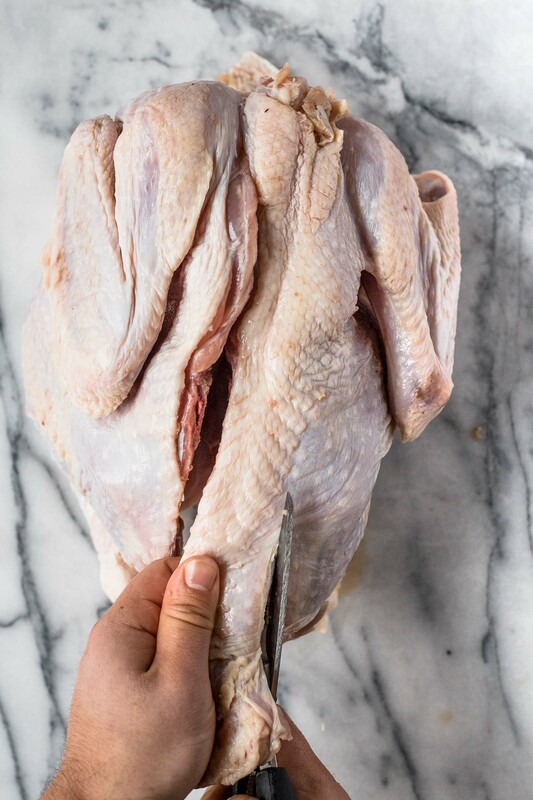 with its back bone removed, you should be able to gently stretch open the cavity of your bird, where you just removed the backbone. carefully run the blade of your knife down the chest bone, as shown here. 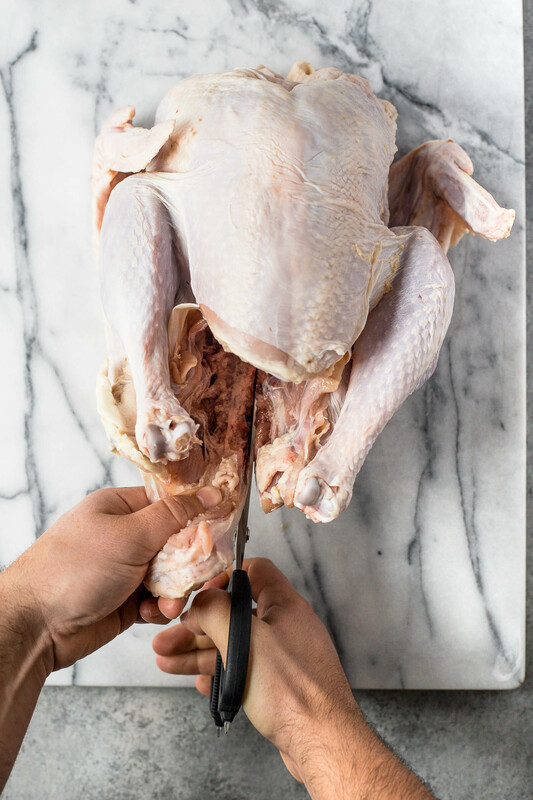 the goal is to score the bone with the blade of the knife, making it easy for you to crack it in just a second when you spatchcock your turkey. it will make a slight scraping sound when done properly! we like to repeat this two or three times, to make the spatchcock super easy. just be careful with the knife – it’s sharp & you don’t want it to slip! at this point, you should be able to stretch the cavity of the bird completely open, until that chest bone snaps. this takes a little bit of effort, so just put some weight behind it. 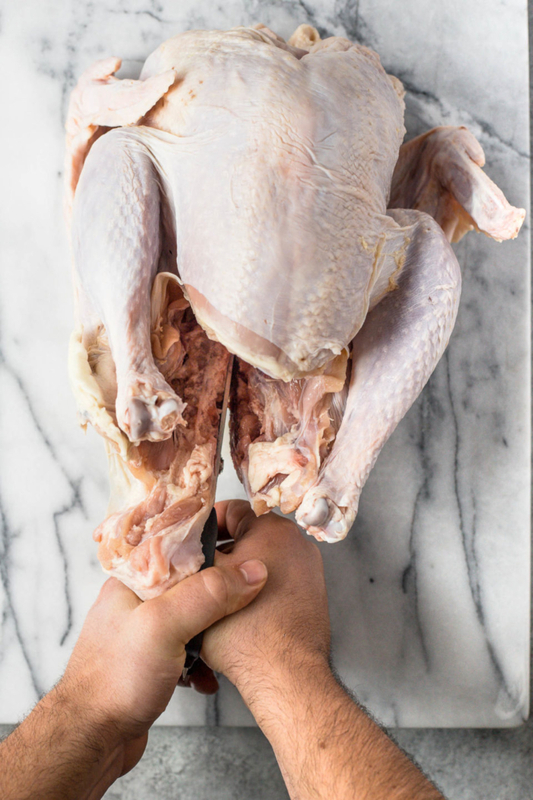 if the cavity of your turkey has sharp pieces sticking out, you can use a kitchen towel to cover them & protect your hands. voila. your spatchcock is complete! yep. you’re gonna get all up in every nook & cranny of your spatchcocked bird & butter it up. 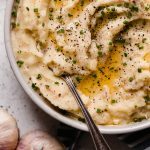 i use a lemon herb butter using lemon zest, sage, rosemary & thyme (& you can find in the exact recipe below), but you can make any flavor combination you like. as you can see here, we’ve kind of perfected our technique of buttering a spatchcocked turkey. we like to grab a few tablespoons of butter with our fingers, insert it under the skin (right on top of the meat! ), and use our free hand to push the butter onto the meat, spreading it across the turkey. give it a try – super easy! 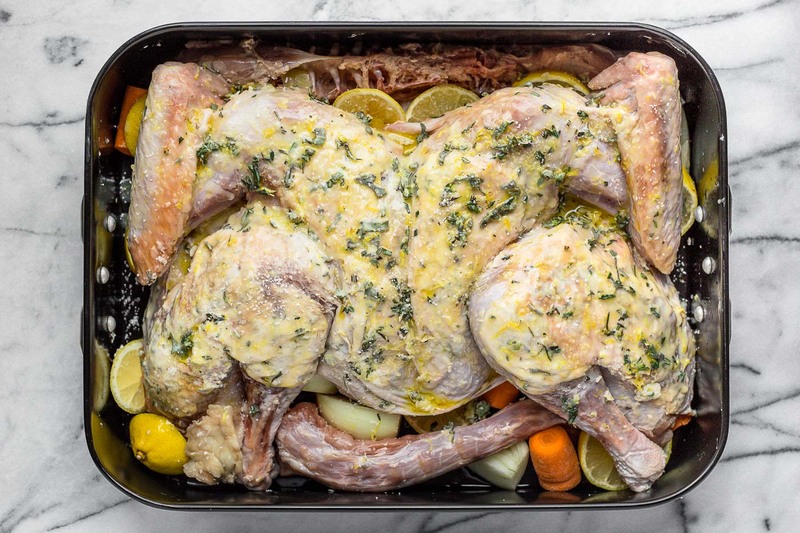 about an hour before your guests arrive, pop yo’ spatchcocked bird in a 450 degree oven & roast, undisturbed, for about 30 minutes. after 30 minutes, drop the heat of the oven to 350 degrees. continue to roast the turkey for another 60 minutes, basting it in its lemony, buttery, herbaceous juices every 20 minutes. don’t have a turkey baster? buy one here – it’s like $4. orrrrr…just use a spoon. it’s the same thing. #7: rest, carve, serve, eat, drink, be merry. what more can i say? ’tis the season! want more thanksgiving fun? 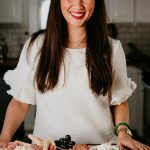 i’ve created a FREE 3-Hour Thanksgiving Guide, the ultimate guide for taking overwhelm out of the holidays & hosting the EASIEST Thanksgiving or Friendsgiving dinner! grab your FREE guide HERE! 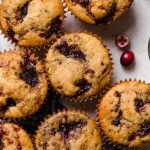 if you loved learning how to spatchcock a turkey, here are a couple more holiday recipes perfect for thanksgiving or friendsgiving! 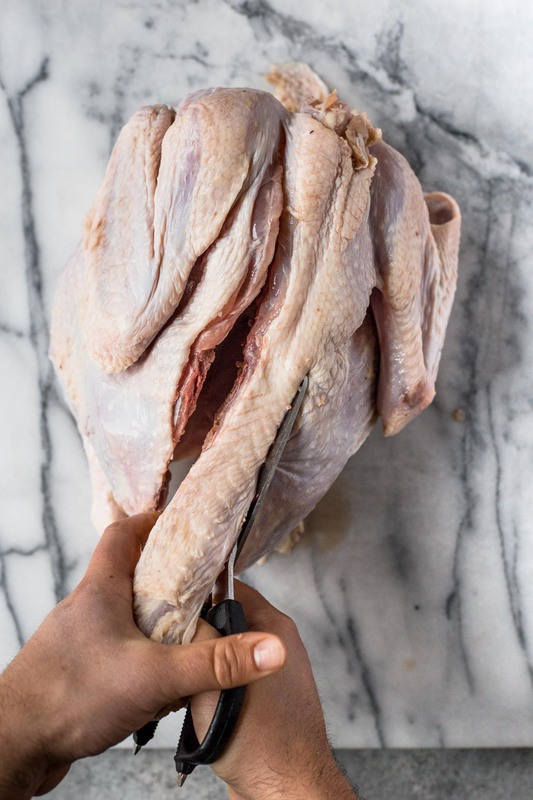 whether you've been roasting turkey for years or you're hosting your first friendsgiving dinner this year, spatchcocking is a miracle method for roasting your thanksgiving turkey. by spatchcocking your turkey, you can roast the perfectly juicy, evenly cooked, & flavorful turkey in less than 2 hours total(!!!) & free up your oven for other delicious pies & sides. 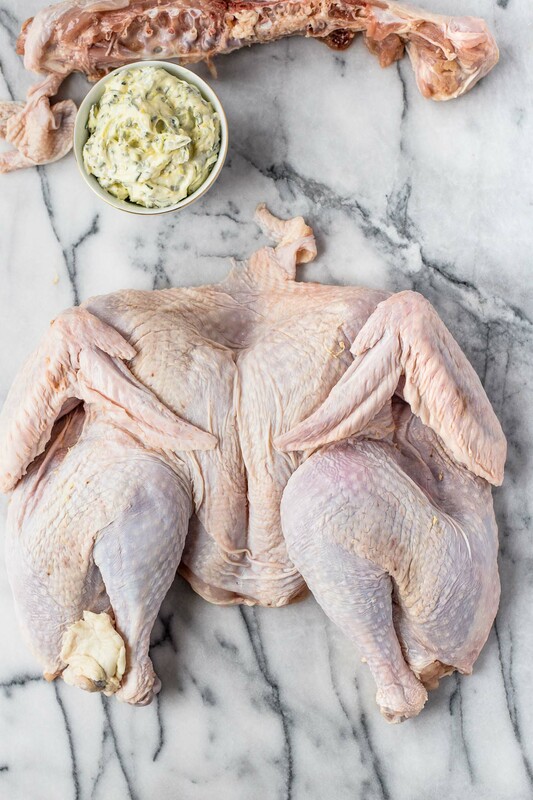 learn more about spatchcocking at playswellwithbutter.com! one last reminder to thaw your bird. a bird that is still frozen will not cook in time for dinner. it just won't happen. the general rule of thumb is thawing in the fridge, 24 hours per every 4 pounds. so for a 12-14 lb bird you'll want to start thawing a little over 3 days in advance to your big holiday dinner. in a bowl, mix together the room temperature butter, sage, rosemary, thyme, lemon zest, & salt until combined. set aside. remove neck & giblets from turkey. place turkey breast side down on a sturdy surface. using a sharp knife or very sharp kitchen shears, carefully snip along each side of its spine until the spine is detached. 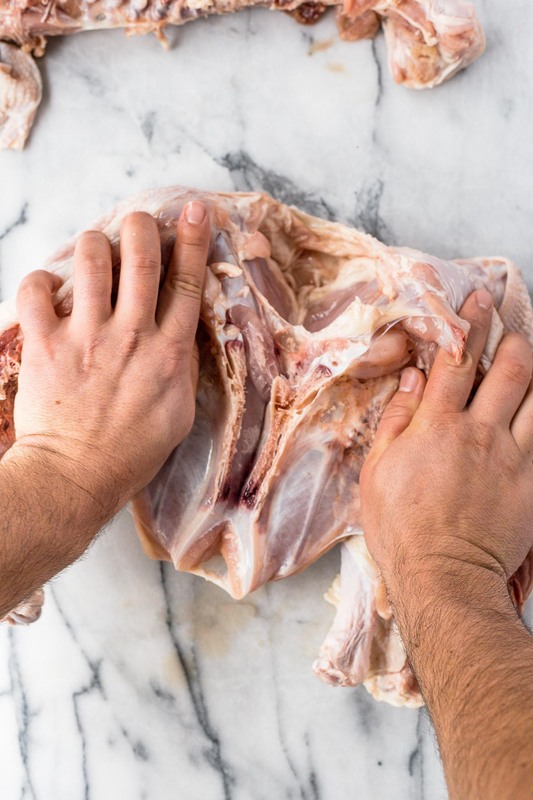 once the spine is removed, use your hands to stretch open the ribs of the turkey. flip the bird so it is breast side is facing you & place your hands on the center of its breasts, on its breast bone. use your hands & body weight to apply pressure to its chest plate, ultimately cracking the bone. 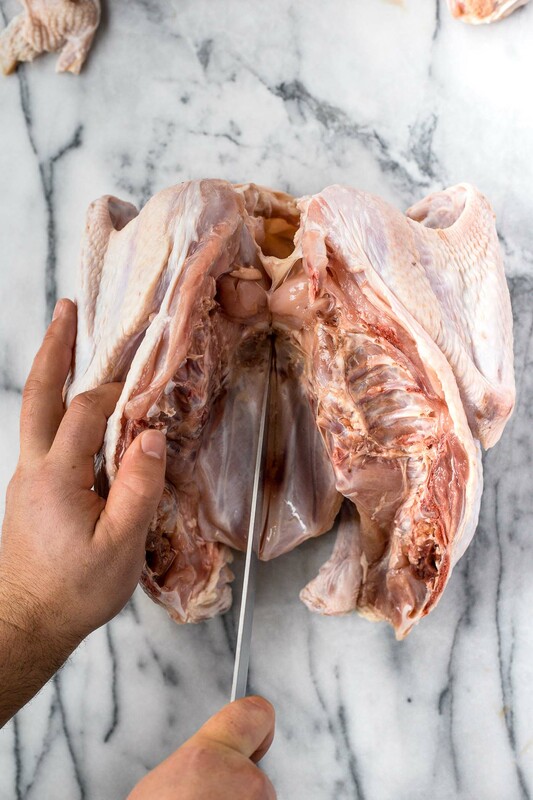 *if you have difficulty cracking the chest plate of the turkey, you can flip it back over and run the tip of a sharp knife over the bone from within the open cavity. these score marks can help ease up any resistance. arrange onions, carrots, & lemons on the bottom of the roasting pan. no need to muss & fuss over this - it can be as rustic as you like. (your guests won't even see!) at this point you can also toss in the neck &/or spine of the bird to roast along with the turkey - it will help add flavor to your gravy. lay your spatchcocked turkey over the onions, carrots, & lemons so the open cavity is open toward the bottom of the pan & the breasts are facing up toward you. gently tuck its wing tips underneath its breasts to prevent burning. 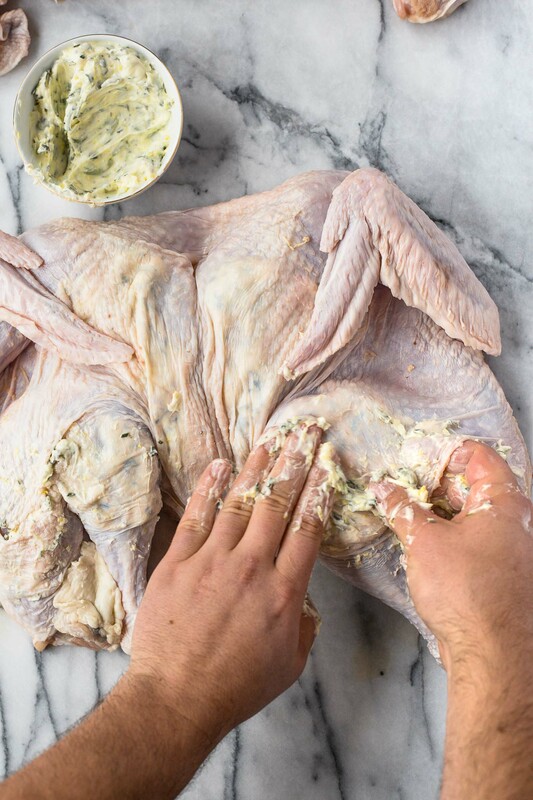 using your hands, spread the butter onto the turkey, between its skin & meat. this will help keep your bird nice & juicy, & full of flavor. 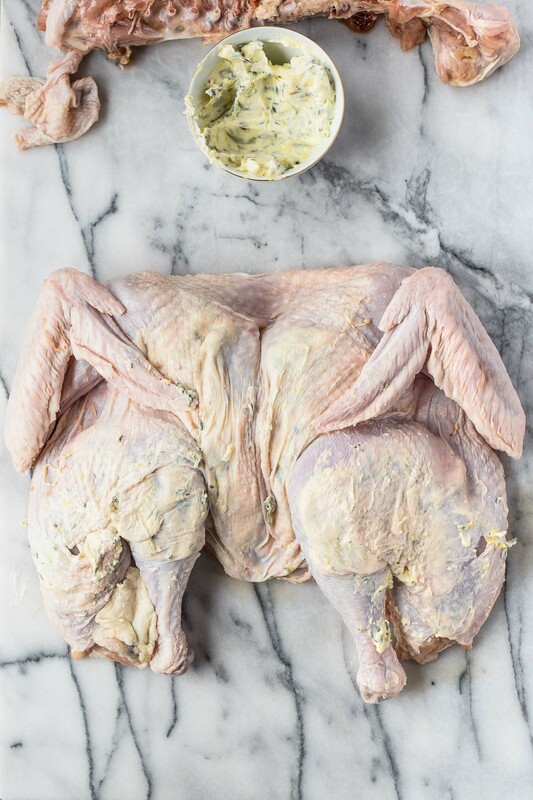 pat the bird dry with a paper towel, & slather it up with olive oil, salt, & any remaining herb butter you have. roast the turkey at 450 degrees for 30 minutes. after the first 30 minutes have passed, baste the turkey with its juices & reduce heat to 350 degrees. continue to baste turkey every 20 minutes for one hour, or until the thickest part of its thigh registers at 175 degrees on a meat thermometer. as you pull out the turkey & baste in 20 minute intervals, it may be helpful to rotate the roasting pan each time you put it back into the oven for even browning. let turkey rest at room temperature for 20-30 minutes. pin how to spatchcock a turkey for later! have you ever roasted a turkey? what are your secrets, tips, & tricks? share them with a comment below – i’d LOVE to chat! JESS! This is a total gamechanger. Like I feel like I could go buy a turkey today and invite people over this weekend and totally knock Friendsgiving out of the park! Your bird looks epic. And I absolutely love the description of the bird – “the turkey kind of lays about a bit seductively” – ha! ellie, it IS a total game-changer. i’ve made turkey 3 times so far this year & there will be 2 more in the next week. it. is. so. damn. easy. lemme know if you try girl! You are fantastic!!! Man, now I really wish i was hosting Thanksgiving!!! And yes, I am dying at your wit nad humor. Killing it GF. This is the most comprehensive, most amazing tutorial ever! Girl you have major skillz! This looks AMAZING! Loved your easy step-by-step guide. I’ve never roasted my own turkey but you are making me really want to try. 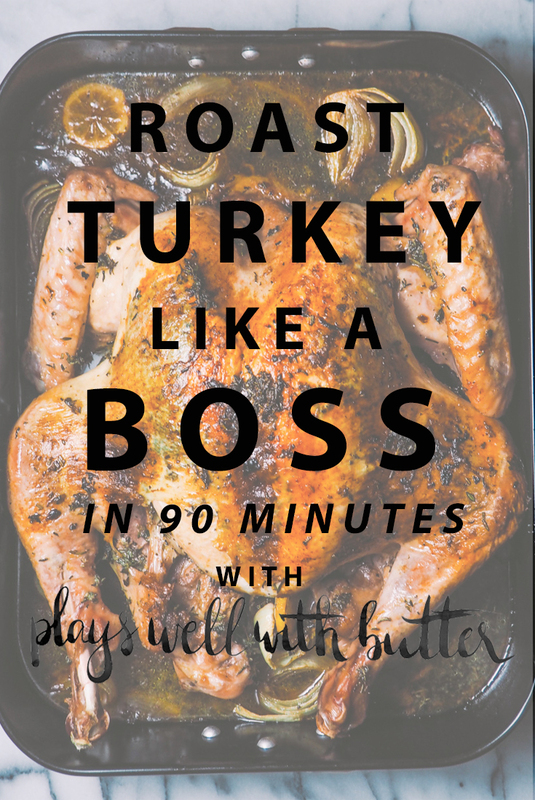 Also… let’s talk about how gorgeous your turkey turned out! Magazine worthy! thank you so much aya! this method seriously could not be easier – i hope you give it a try! Girl, you just killed this post. AMAZING tutorial. I have never cooked a turkey before (always too scared). Love the step by step photos! thank you so much, chrissa! 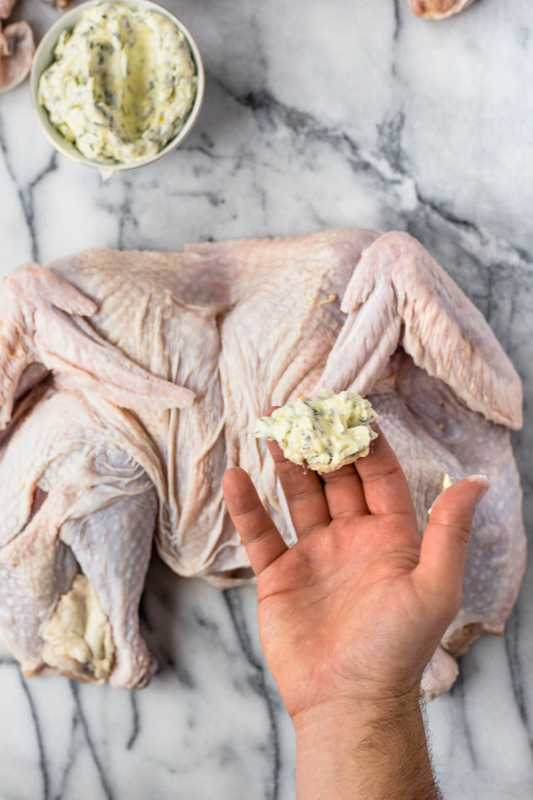 no reason to fear the turkey…this method is seriously so easy. I wish I had a friendsgiving to host this year to make this, it looks amazing! I made my first turkey 2 years ago and it wasn’t the best. We cut it and then had to put it back in the oven since it wasn’t completely done haha. I’m gonna send this to my friend whose house we are going to!